One of the nice features of the Galaxy S 4 and other cellular phones is that the phone keeps a record of the calls that you’ve made and received. Sure, you might have caller ID on your landline at home or work, but most landline phones don’t keep track of who you called. Cellphones, on the other hand, keep track of all the numbers you’ve called. This information can be very convenient, like when you want to return a call, and you don’t have that number handy. 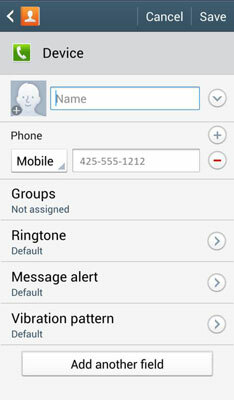 In addition, you can easily add a number to the contact list on your phone. Incoming call you missed: A red phone silhouette with a broken arrow. Mark that number as a favorite by tapping the star icon. 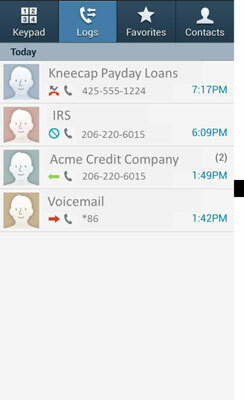 Your favorites appear on the Keypad screen, which saves you from having to dial those numbers. Add the number to your contacts list by tapping the “Create Contact” button. A pop-up gives you the option to add it to you contacts, either by creating a new contact or adding to an existing one.